In a world where Global Energy demands are becoming unsustainable Elliotts took the decision to offer our customers the widest range possible of energy efficient equipment. At our new Renewable Energy Showroom in Bar Hill Cambridge, we have one of the largest working displays of equipment dedicated to saving energy in the home and business premises. Energy, heating and cooling costs are rising, with a corresponding negative impact on the environment. The proportion of total UK carbon dioxide emissions resulting from domestic heating has remained more or less constant over the last 10 years at between 18 and 19 per cent of total UK carbon dioxide emissions. Add to this emissions through heating public buildings and the total is well over 20%. We take seriously the need for businesses and the individual to find alternative ways to meet heating and cooling requirements whilst saving on costs and helping the environment. If land space is limited the ground collectors can be installed vertically in a borehole, drilled up to 100m deep in the ground. Multiple boreholes are commonly used in large installations where very high levels of heat extraction are required. If a large enough land area is available, horizontal ground collectors provide an effective method of extracting heat from the ground. The pipework is buried at a depth of approximately 1.25m and spaced 0.75m apart. The land area required is dependant on both the capacity of the heat pump and heat conductance of the soil type in which the pipes are buried. As a space saving alternative to horizontal collectors, slinkies – consisting of coiled pipes buried in a trench – can be used. Ground and air source heat pump technology is now well proven, having been successfully used as a means of domestic heating for over 30 years. Heat pumps generate no carbon emissions at site and use approximately 25% of the energy required by a conventional gas or oil fired boiler. Also, unlike solar energy solutions, heat pumps can provide all of the energy required for a building’s heating and hot water. As the cost of fossil fuels continues to rise the savings resulting from the use of heat pumps will increase, and the payback period for the required investment will decrease. 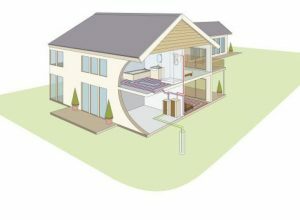 We work with the sole UK agents for Lampoassa heat pump systems who have been successfully installing ground and air source systems for a number of years. Fully registered under both the BRE Microgeneration Certification Scheme (MCS) and the Renewable Energy Assurance Listing (REAL), they are approved for all public sector and private grant qualifying projects. They provide a full “turn-key” solution to their customers including survey, design, equipment supply, installation, including ground works and commissioning. Lampoassa systems have output ranging from 5kW to 600kW – thus meeting the needs of a small terrace house to a large office, school or apartment complex. Lampoassa have a superb reputation for reliability and efficiency. Designed to work under the gruelling winter conditions of Finland, their air and ground source systems take the UK climate in their stride. The air source system for example, is designed to work effectively down to minus 15’C. As the system is manufactured of the highest quality, anodised components, Lampoassa ensure that it will continue to work efficiently and quietly for many years to come.